A few weeks ago, I was really ill. My mum & dad had to take me to the vet at 9pm one evening, because I was in such pain with a tummy ache. The vet gave me some injections and sent me home again. Because I was ill, I couldn’t go to the gala at the Severn Valley Railway, so I was really upset – as my dad went on his own. Unfortunately, during the day I was still in a lot of pain & my mum had to call dad to come away from the gala to take me to the vet again. Saw a different vet this time, she was really worried about me & thought it might be problems with my pancreas. She took a sample of blood for testing, and gave me another injection I was told no more treats & no fat in my food. Anyway, after a few days I was feeling a bit better, just being fed on chicken, rice and Chappie dried food, as suggested by the vet. 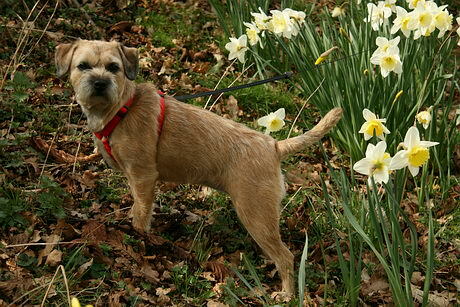 Fortunately, the blood tests showed I did not have pancreatitis, and thanks to all my friends who kept asking about me. This entry was posted in KC's Blog on March 31, 2009 by KC. I’m being pressurised to get the decorating finished. “Computer corner” now looks a bit bare, with desktop pc disconnected & moved out. Computer desk (work station sounds so naff!) will be shuffled around the room so that I can get to the walls & skirting board for painting. It would be so much easier working in an empty room, but never mind. Good job I have a laptop to use for accessing the internet & all the latest news. This entry was posted in My uninteresting stuff on March 31, 2009 by Sharpo. It’s me, KC – I’ve got my blog page! My dad hasn’t been updating my gallery with photos recently, so I will add the occasional photo here. It’s nice & colourful at this time of year, but there are no sheep in the field for me to watch. This entry was posted in KC's Blog on March 30, 2009 by KC. 7802 was on the Maroon set heading for Arley & would be the 11.38 departure for Kidderminster. 686 or “Thomas” was also seen in the distance at the station, waiting for a chance to trundle along towards Kidderminster. 4566 headed for Bridgnorth on the 12.10 leaving the line clear for 686 to head south. 5164 was on the diner, which crossed with 7812, and as it was a sunny day we waited for the return of 7802 on the Venturer. 46443 was no doubt on the F.E. during the afternoon. This entry was posted in Severn Valley Railway on March 29, 2009 by Sharpo. Around Arley, as usual, 5164 was on the train from Bridgnorth & due away from Arley at 11.38. Next train for Bridgnorth had 4566. The diner was running today behind 7802 & crossed with 7812 from Bridgnorth. As it was rather chilly & some black clouds were looming ominously in the distance, we didn’t hang around to see 5164 return & headed home earlier than usual. Back to the car before it rained, but glad to be heading home as it bucketed down soon after. 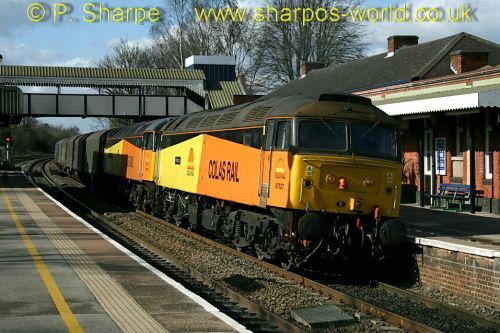 This entry was posted in Severn Valley Railway on March 28, 2009 by Sharpo. Saw it pass through Barnt Green (heard it coming from miles away!) and was surprised only one loco on the train. Having seen many postings the previous evening about attempts to get 37406 ready (and failing) I was expecting to see a 67 somewhere in the formation. Will sort a photo or two later. This entry was posted in Main line on March 28, 2009 by Sharpo. This is something I missed. Apparently it went through Walsall earlier today & had I known about it then I might have been out somewhere to see it. Still, hopefully it will be out on the mainline again soon. At least I have seen it down the “dark side” a couple of times last year or whenever it was. This entry was posted in Main line on March 27, 2009 by Sharpo. No idea what this was going to be, but as it only involved a walk to see it & not much else of interest comes round the “dark side”, I couldn’t really resist putting down the paint brush to go & see it. Turned out to be 66135 with some of the big scrap box wagons, think they were empty. No idea why the destination was Gloucester, unless Advenza are having them? Won’t be going to see the light engine return working this pm. I’m getting behind with updates again, but at least here are 10 photos from today. The colourful Colas Rail 47s on the Burton to Dollands Moor empty steel train. This entry was posted in Sharpo's World Photo Updates on March 27, 2009 by Sharpo. Today I had a quick visit to Dorridge to see the above 47s on the Dollands Moor train. That’s 3 weeks on the trot now that I’ve seen it. I’m getting used to the livery now! This entry was posted in Main line on March 26, 2009 by Sharpo. Nothing exciting today, rubbing down skirting board, walkies round the park with KC & a bit of tidying up on the computer. At least an entry on the calendar for the day, if nothing else! This entry was posted in Computers on March 25, 2009 by Sharpo. I saw yesterday that 47245 was working a stock move from Southall to Carnforth today & decided to go to Stafford to see it. A bonus was 57601 & 47804 heading north as a light engine move, also to Carnforth I presume, something I was not expecting. This entry was posted in Main line on March 24, 2009 by Sharpo.